MINI TURBO KITS - Limited stocks. We have MCT170, and MCT300 kits in stock and will have the ever popular MCT200 in stock again shortly. Turn your MINI One or Cooper into a Sensational car. Make your Cooper S invincible with our fabulous Slipstream Twincharger kits!!! 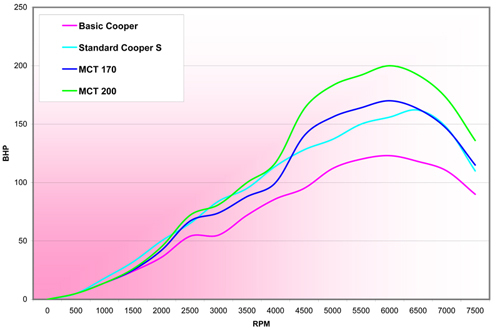 High power from low boost - these turbo kits are superb - everything you need to convert the car. Fully reversible. Will pass emissions tests, and can retain CAT with our high flow modifications (pictured below). Nut and bolt job - no need to remove sump with new oil drain system. Don't delay as we currently have limited stocks. 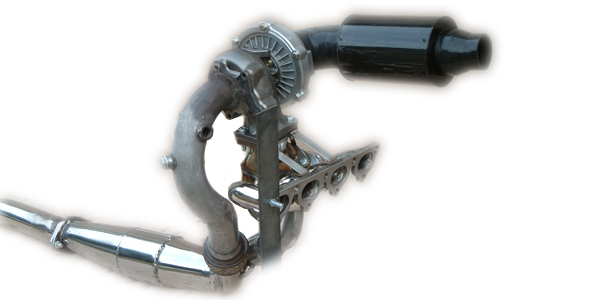 New 3" megaflowing polished stainless steel exhaust specifically designed for Turbo MINI's! Sensational Power Outputs (below) through efficiency that a supercharger just does not have. MINI LAMBOS proving as popular as ever. Now with LK500 type 10 bearing mechanism and better balanced support rams mean they are even easier to close!! Price reduced to £750 due to investment in equipment and a reduction in our cost price. Lambotek - the first Lambos for the MINI are still the best and the cheapest!!!! Our interest in the BMW MINI started in 1997 when it was first unveiled as a prototype at the Frankfurt Motor Show - at this point we decided we wanted one. 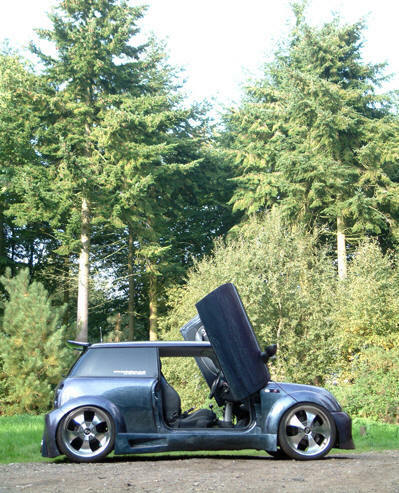 Our hands on work first stared on July 7th 2001 (launch day) when we took delivery of what is probably the first MINI to be purchased, at a point when the cars were just not being sold. Our multi-featured Red Cooper registration number Y131GEX is car number 186, and was one of the dealer demonstration cars. We are eternally grateful to BMW since they were not supposed to sell these vehicles until October 2001 when replacements were due. In the three years since the launch of the fantastic new MINI we have developed many products (we had to at the start - nothing was available), and have built numerous cars for show, feature, and even for competitors. As such we have a level of experience with these cars that our competitors just cannot rival. If you want a one-off BMW MINI then please contact us by phone on 08707 518 518 or by clicking the Email logo above.